Solskjaer led Manchester United side are on a roll and have won 10/11 matches whilst drawing against Burnley. The Norwegian is taking the United side to the next level which represents the United team from decade back. A good portion of the credit goes to winger and foward Anthony Martial. 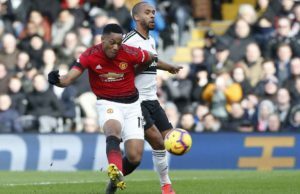 The France forward set up countryman Paul Pogba’s opener and himself scored a splendid goal in Saturday’s 3-0 win against Fulham. On being asked about whether Martial was similar to former Red Devil Ronaldo , “He does have similarities, of course” said Solskjaer.